Paris, Barcelona, Buenos Aires, Madrid, New York – all are characterized by their vital dynamism and cultural singularities. Nevertheless, there is a place that is the same in all cities despite small and sometimes radical differences. Photography in Marbletown finds the place and moment for which it was invented, its essential elegiac meaning. 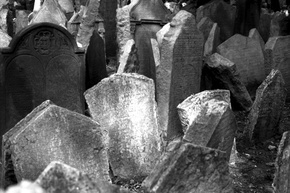 The identical white tomb stones in military formation contrast with the old stones in Prague’s Jewish cemetery that seems to crowd in organic disorder. 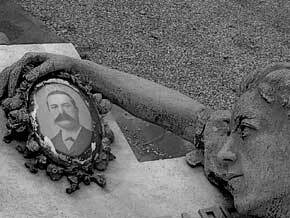 In Genoa, the romantic splendor of death sensualizes the ultimate place of silence and sorrow. But in spite of these superficial disparities, all cemeteries are one and the same, the place where we all face the same fate. Flowers survived through the ages as the main offering in Marbletown. But once they are cut, they quickly loose the scent that once exalted the union of the visible and the invisible. Gone is this sensuous bond that linked the living with the dead, the real with the illusory. Here a rose is no longer a rose. There is no joy but only grief in its giving. When cut and offered, flowers enter the language of meaning. In the world of the living the rose is a symbol of love and passion, while in the Christian funeral rite it symbolizes purity and martyrdom. In one place we smell its perfume; while in the other doing so would be an odd if not aberrant gesture. The recycling of symbols by mutating their meaning gives a surrealist appearance to Marbletown. The garland that once adorned martial victories here symbolizes divine redemption. The urn survives both as container for ashes and as a carved symbol, often sharing the stone with a willow, whose semicircular shape forms the headstone of many tombs and reminds us of the arched gateway between the sacred and the profane, the arcus fastigium of the Church. The recycling of symbols by mutating their meaning gives a surrealist appearance to Marbletown. In ancient Greece the torch was a symbol of life and virtue. Its significance was modified by various cultures until it came to represent knowledge to some and universal redemption to others. Both the palm and the garland lost their meaning rooted in temporal battle to the message of eternal peace. The joined palms of the hands, once a sign of unity and immortal affection now are both a gesture and a representation of faithful prayer. Some hands hold crosses or hourglasses, and others hold books left open in the middle, as if a sudden overwhelming fatigue had forced the reader to abandon the reading of a lengthy story long before its conclusion. Hands feebly hold imperishable flowers, count rosary beads, hold a bottle, a brush, a hat, a pick, a valise. Stone widows look at photographs of their departed husbands, and soldiers still cling to the last thing they held, their rifle. Unwilling to let go, children hold their favorite toy to their chest. Marble has survived from antiquity as the symbol of immortal nobility. It withstands the passage of time, and it can easily be inscribed with the essential dates of birth and death. Some leave a short prayer written in a style based on the common perception of a pain that although universal is always singular and private. The mausoleums in Marbletown are a distant Etruscan reminder of the great tomb that Queen Artemisia built more than six hundred years ago in Halicarnassus in honor of her brother-husband Mausolos. We still see the Egyptian obelisk and the column, former symbols of victorious wars, and now, broken, attesting to a life cut short. There are many sized copies of the pyramid that a Roman governor brought from Egypt to Rome as a decoration for his final resting place. In the Middle Ages, some thinkers imagined body and soul united by a chain of gold. The break of one of its links would signify the end of life. Chains carved in stone with a broken link still remind us of that old belief. Some angels, trumpet in hand, await the hour of the last judgment; others reflect or sleep in symmetry with those who lie under their custody. We can still see the desolate expression of the melancholic angel that Dürer etched three centuries ago. In Marbletown there are children dressed in their Sunday’s best who seem out of place among skeletons entwined with maidens dancing the last dance. Nearby are illustrious poets on whose head sits a stone laurel and whose verses once immortal are now forgotten. Here the famous and the anonymous, family and strangers, friends and enemies share the same hour that no longer matters. Those who once enjoyed material goods may now rest their bones under the dust-veiled colors of stained-glass windows that were meant to be seen “a contrejour”, from the interior semi-darkness of their expensive mausoleums. Here there are stone cushions indented by the weight of a knee never bent and where the rain has left a small puddle. Cats, with their fine instinct in their search of silence, flee from the living and find their Shangri-La in Marbletown. Here, virgins caressed by moss and acid rain implore heaven, and citizens with a charged look of stoic piety stare at the final hour while on their shoulders a spider patiently weaves a luminous web. There are captains of industry and finance facing the unknown with virile determination faithfully displaying fictitious male virtues associated with science, reason and wisdom, virtues firmly asserted in the nineteenth century. These women of the nineteenth century assigned the place of emotion and its disorders do not scrutinize distant horizons; their sight is lost in the depth of endless sorrow, and their shoulders are dropped in defeat. With their hands weakly entwined, they implore, pray and cry. The life-size sculptural arrangements of the romantic age tended to de-emphasize the dead and stress the mourners; alive, grieving and catching our eye. The monument they once commissioned to honor their dead has become a backdrop for their own grief. Often the deaceased is represented by a bust of his likeness, a classical format in the construction of prestige, a cousin to medal and coin. Under gray arcade galleries protected from the seasonal elements, a thick layer of dust covers faces, arms, suits, dresses, garlands, crosses and shoes, and an entire family bids goodbye to an old man on his deathbed. In these tableaux vivant the disaster of life assumes an appearance both tender and, to the eyes of our era, theatrical. The funerary statuary in vogue among the bourgeoisie nearly two hundred years ago coincided with the invention of the photographic camera in 1839. Its technological genesis in darkness and light could be a metaphor pointing to the nature of photography as essentially a funerary art. Even at its most objective, a photographic image holds an implicit melancholy. Every photograph is a reminder of our disappearance -it always mourns the viewer. Transparency and concealment, past end present are the elements of an irresoluble conflict conformed in the photographic fact which is located beyond the mirror and much closer to the mirage of a remote familiarity. Opaque and yet transparent is lodged beyond what the eye perceives. It confronts us with what was and no longer is, with what we know but we don’t know. One of the first uses of photography was to replace the facial mold taken from the deceased on their deathbed. In the prior lost-wax process, the positive image was in the form of a mask. The photographic portrait rapidly took the place of masks and funerary sculptures, but not without first inspiring surreal mergings of marble widows, their gaze locked in eternal sorrow on their husband’s enameled photograph. The photographic portrait prohibits the poetic metaphor and the sentimental narrative. If art molds the construction of social, sexual and emotional narratives, the photograph inlaid in the gravestone has the unequivocal appearance of a document as proof of past existence. Photography in Marbletown finds the place and moment for which it was invented, its essential elegiac meaning. In the photograph of the living we see the gap between past and present: we age. And looking at the portrait of the dead, we see the portrait of Dorian Gray without Dorian Gray. Like a cameo inset on marble, we finally see what all photographs have always shown us - it is not that we age but that we die. For the time it takes to blink we occupy the same place a lens once did and looking at what it saw, we see ourselves. Marbletown is a labyrinth of mirrors.